Pyramidal plant growing 10 to 14 feet. Spread 3 to 4 feet. Bright lustrous emerald green color all year, does not discolor in winter. Very compact. Space 2 to 3 feet apart for windbreak or visual barrier. 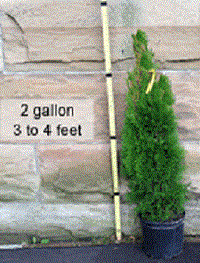 Recommended Zone 2, 3, 4, 5, 6, 7 Scientific Name Thuja occidentalis Mature Height (ft) 12-14 Feet Mature Width (ft) 3-4 Feet Growth Rate 6-9 inches per year. Spacing 2 Feet for quick privacy Light Full Sun or Partial Sun Shipping Height 2-4' Feet. 2-4 feet at time of shipping. Ships depending on how the customer would like with or without 3 gallon pot items will arrive within 1-10 days from date the plant(s) are ordered. *Picture is example only** This item can't be shipped for free, As these are too heavy and is part of the excluded items for free shipping.